Is it time to see a doctor about your toenails? 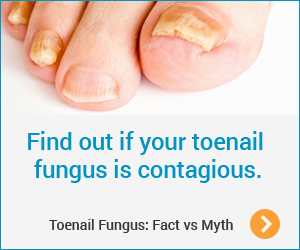 Take the Toenail Fungus Check-Up to find out! Are you aware of the different treatment options available to treat toenail fungus? Have you seen a doctor about your toenails? Have you tried anything to treat toenail fungus? Is your toenail fungus treatment working as well as you'd hoped or expected? Do you have any other questions or concerns about your toenail fungus treatment? Based on your answers, it's time to make an appointment to see your doctor about your toenails. Your doctor can recommend a treatment and make sure you're getting the most from your treatment. Use the Doctor Discussion Guide to prepare for your visit. Print your results to bring to your visit. View the Toenail Fungus Treatment Table to learn more about treatment options.